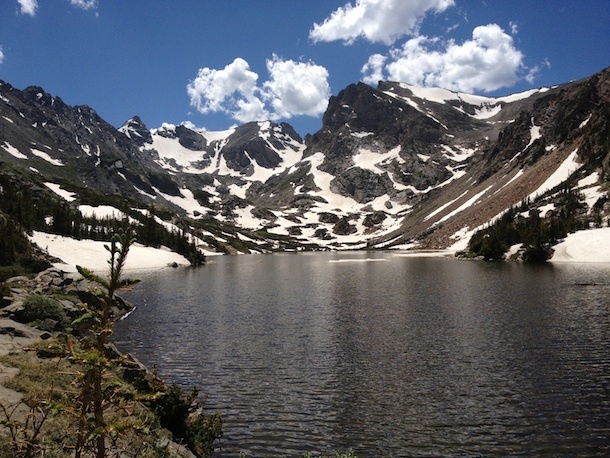 Our first trip to Brainard Lake Thursday, June 27, was a smashing success. The whole area was dazzlingly gorgeous under a deep blue sky. Huge changes have been made — in particular, the road that ran north of Brainard Lake and up to the Long Lake and Mitchell Lake trainheads is being rerouted so the area east and north of Brainard is now traffic-free, a nice improvement. There are many other changes, too (new structures and parking lots, and the new Gateway Trailhead about two miles east of the Brainard Lake complex). 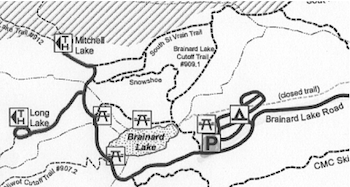 The new road to the two upper trailheads is being rerouted to south of Brainard Lake. Since that road won’t be open until mid-July, we parked east of Brainard and hiked all the way (well, “all the way” for me) up to Lake Isabelle, which was filled up and boisterously overflowing into its two beautiful waterfalls. It still had snow-capped ice floes in the middle of the lake (probably not for long). Get up there…it’s gorgeous! And (for you newbies) it’s only 45 minutes’ drive from Boulder.